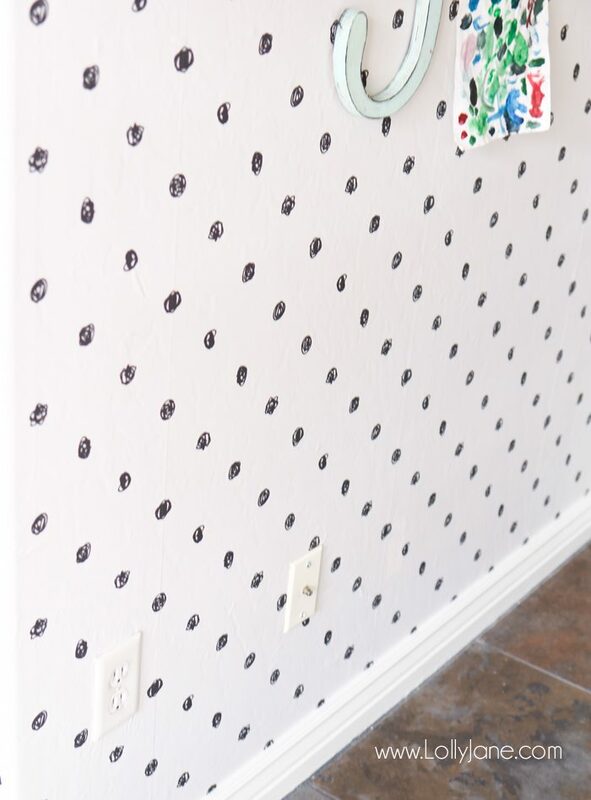 Have you jumped on the peel and stick wallpaper trend? 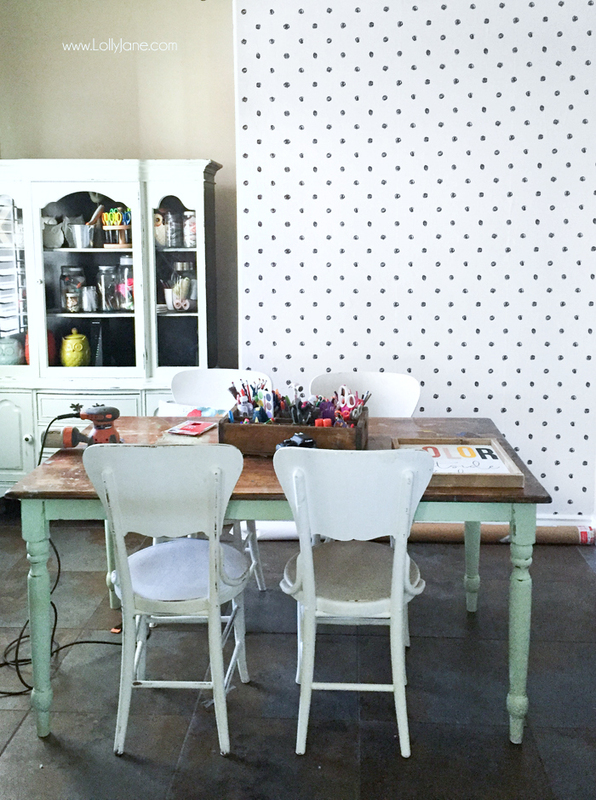 We love how this easy to apply wallpaper transformed our craft room makeover. 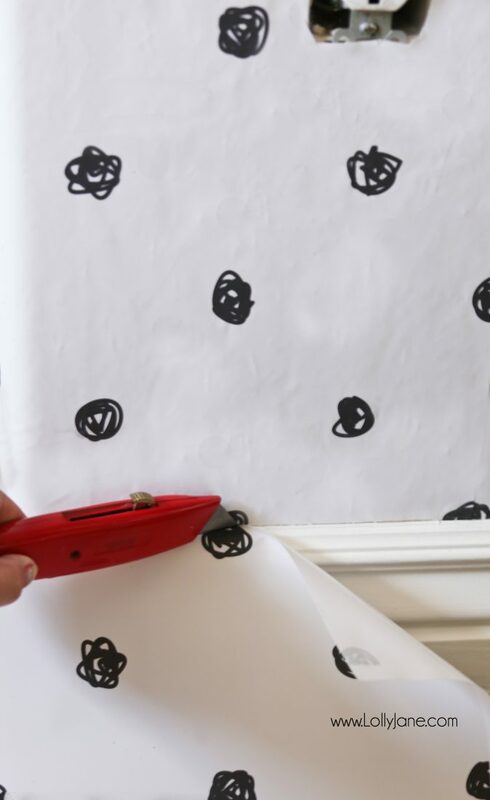 Learn how easy it is to use peel stick wallpaper for your own room makeover dIY. Holy cow, I still walk by this room several times a day and give it a second glance in awe at the difference… and it’s not even finished yet! We bought this house in the fall with this den/extra room off of the family room and it. was. so. drab! I am all for a neutral pallete but the tan walls with the dark floors had me anxious to brighten this space up! 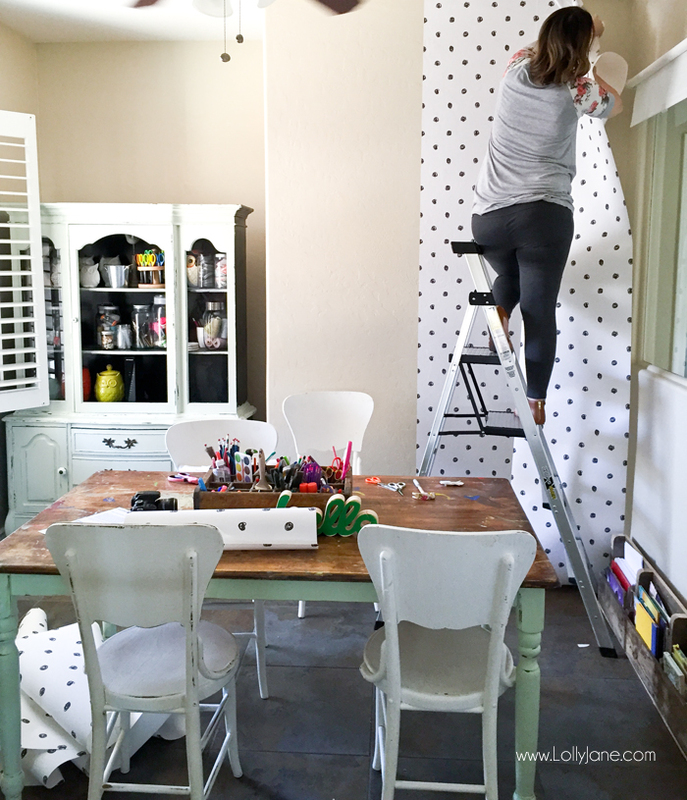 Enter Walls Need Love, removable peel and stick wallpaper. Appropriately named since my walls DEFINITELY needed some love. I selected the Scribble Dots pattern, (and it took me several hours to narrow down the design I wanted because the selection is ga-ga-gorgeous!) 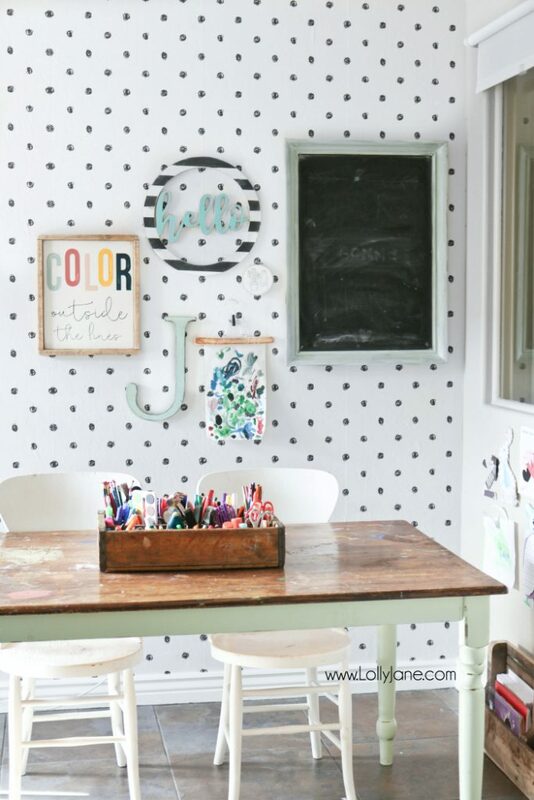 since it’s playful yet still serious enough for a grown up space, too! Want to see the hideous before? 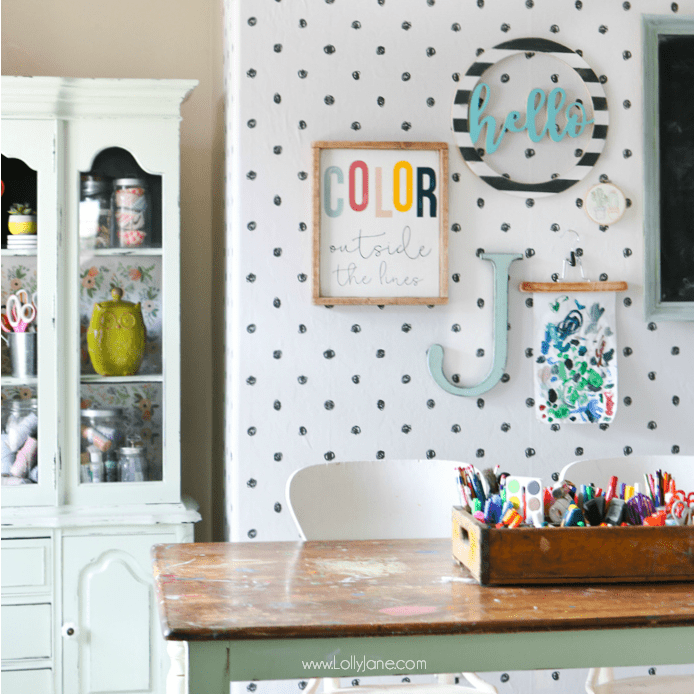 I seriously can’t believe the difference the white background on the wallpaper does to brighten up the space! I loved how easy the packaging was and how clear the instructions are. Since I was tending a fussy 3 month old on the only free day I had last week to hang the wallpaper, my fab blog partner and twin showed up armed with a fresh Diet Coke fountain drink and ready to work! (She is the best, for real!) She got to work and hung the first strip in the center of the wall and worked to the right, then the left. Our number one tip is to have patience! It can be tricky to line the wallpaper up when you start a new panel, be patient! You can remove and tweak as needed, it’s strong enough not to tear so line it up and press down firmly when you’re lined up correctly. Our biggest tip is to let new paint cure for 2-3 weeks. 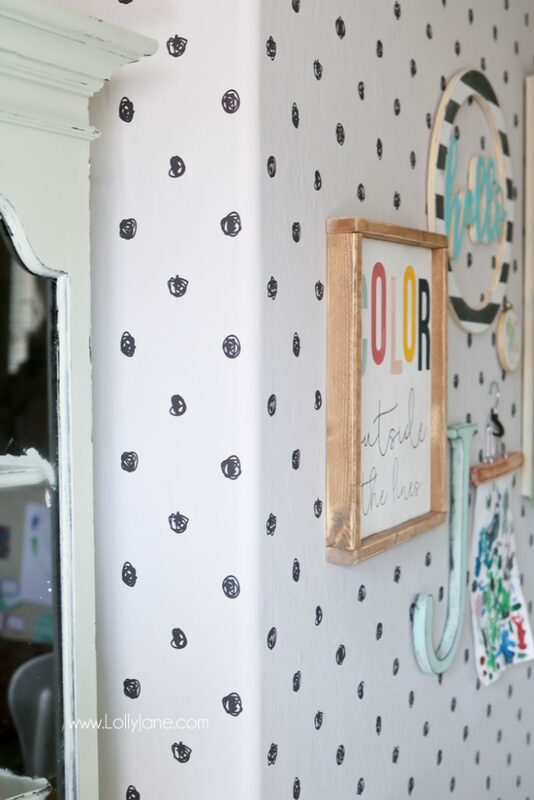 Otherwise, your paint will dry and the seams will dry with it and shrink, creating a gap in your wallpaper. TRUST US, DON’T SKIP THIS STEP! If it’s older than 2-3 weeks, wipe your walls down so they’re dust free and you’re good to go. Because the wallpaper is heavy, it’s easier to pre-cut then apply. This is optional but makes it easier. Pull the backer paper down about 18″ or so to work with small pieces at first. When your top piece is lined up with the ceiling, smooth it down then keep peeling the back piece off and pull down as you smooth. 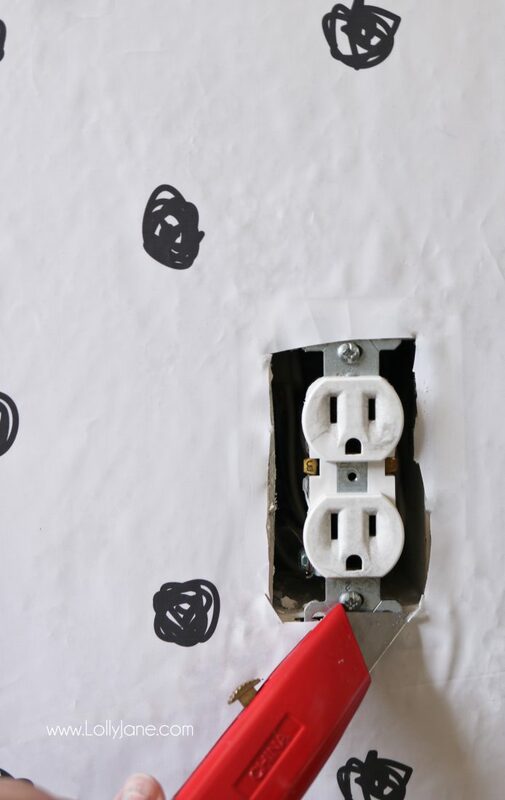 DETAILS: We wallpapered right over the outlet and cable outlet then used an Xacto knife to cut around it. So easy! Here’s a little peek! 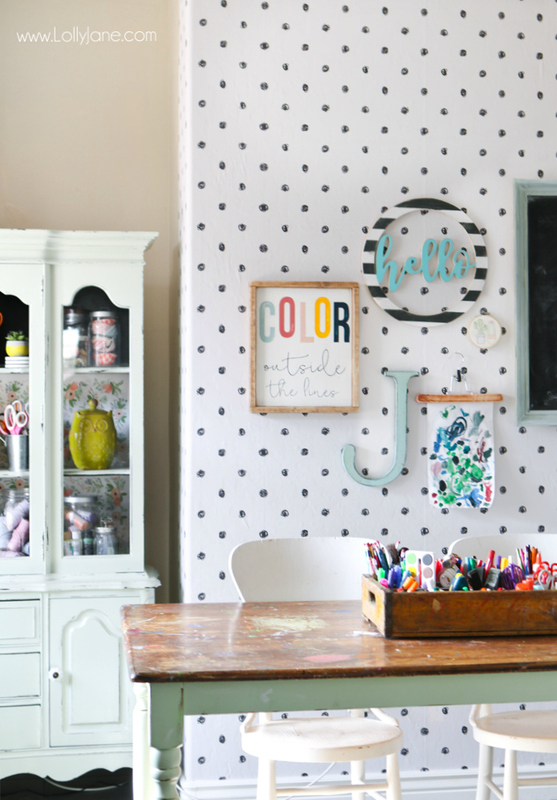 The newly painted mint hutch pairs much better with the bright wall than the black and tan… am I right or am I right? lol! Wallpapering over the corner was a breeze! I started from the top and just smoothed it out, pulling a bit here and there, until it was nice and tight with little to no air bubbles. 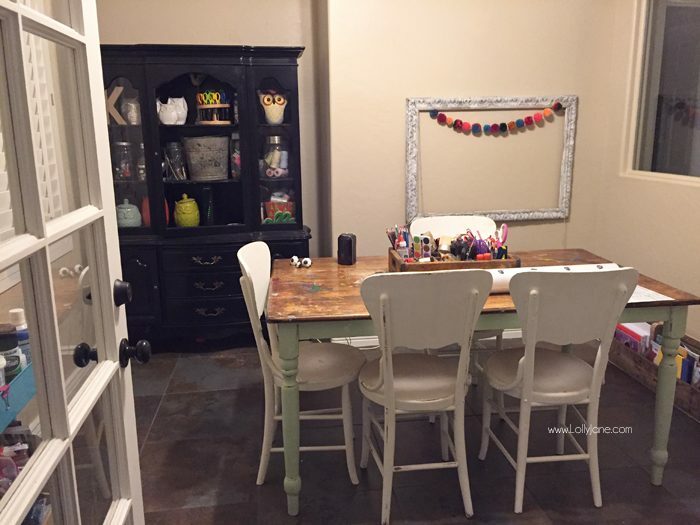 So far it’s coming together and I am so happy to have a fun area for my creative littles to draw/color/paint in! Hi, friends! We wrote this post back in 2016 and it’s currently March 2019. We’re happy to say that it’s held up PERFECTLY. We’re not exaggerating when we say the word perfect; no gaps in the seams, it hasn’t peeled, none of the corners have moved. We can’t say the same for other brands, unfortunately. 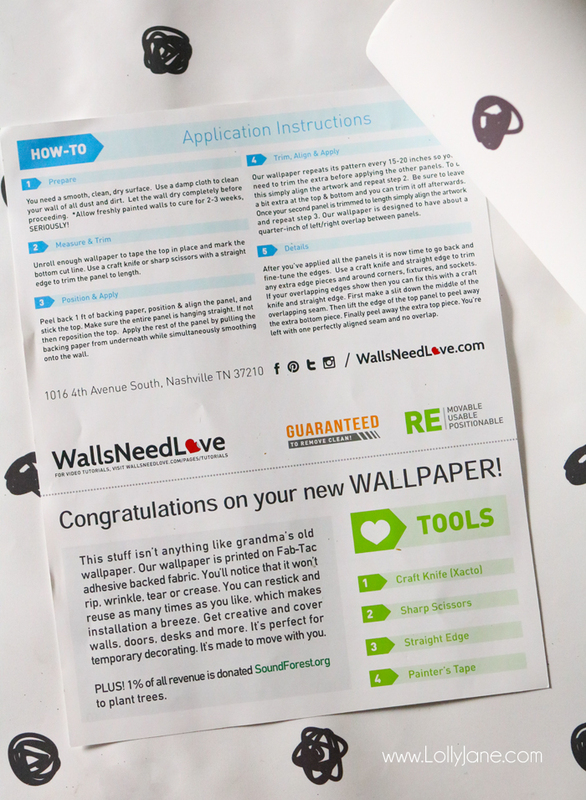 Walls Need Love states: Peel and stick wallpaper application is just a more modern, better way to apply wallpaper. Tested and improved. We’ve developed and tested our adhesive backing for over a decade, to ensure that your wallpaper won’t separate at the wall edges or corners after just a year or two. We have found that to hold true, way to go, WNL! Love, love, love the wallpaper!!! What a difference it makes!! And i love polka dots. Looks amazing!! Love it!!! Looks so good, I’ve really been in love with all the wallpaper choices these days. 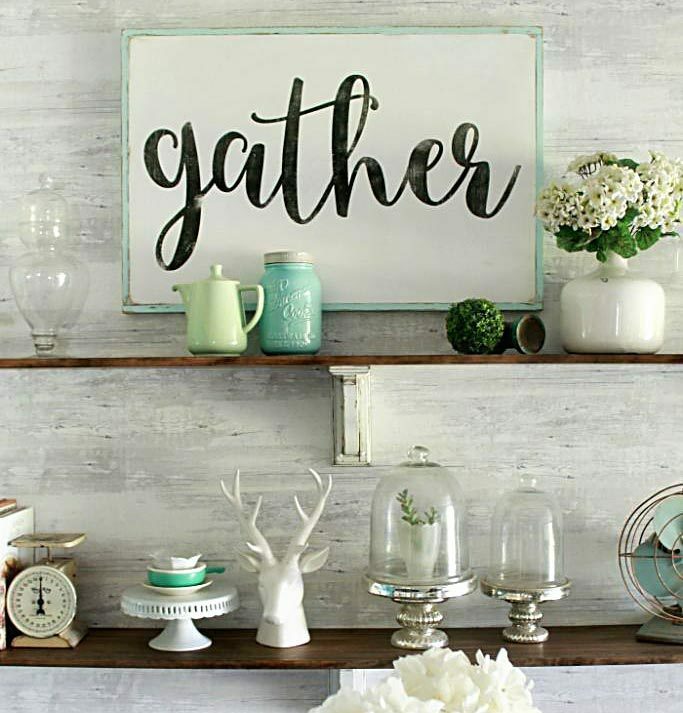 They brighten any space and add a touch of fun to any room. Can I ask where you got the “hello”? I’m on a hunt to find one! Love the wallpaper! So cool! That wallpaper looks awesome. I put some Dulux paintable wallpaper on my walls over a year ago and still havent painted it. I cant decide on a colour. The stuff I used claims to hide imperfections in the wall. This peel and stick stuff that you used sounds a bit easier than the paste I used. It’s not as hard you expect hey? I checked out the site you bought from. They have some great stuff on there.